The outlaw Jesse Woodson James (1847-1882) is generally thought to have been shot and killed by Robert Ford on April 3, 1882. Ford, a James gang member, reportedly shot James, then 34 years old, in the back of the head at the Kearney, Missouri home of Ford’s sister as they prepared to head out for another robbery. Ford’s motive was to obtain a reward. Ford and his brother pled guilty to murder but were pardoned by the Missouri governor Thomas Crittendon. Although James body was identified and buried in Kearney, Missouri, alternative accounts persist that he somehow faked his death and moved to Texas. One such tale has him moving to the Granbury area (Hood County) and working until his retirement as a railroad contractor under the name of J. W. Gates or J. Frank Dalton. In his latter days, Dalton reportedly revealed his true identity to Sheriff Oran C. Baker before Dalton passed away at age 107. Sheriff Baker’s account was that shortly before Dalton’s death, he had been contacted by Dalton’s grandson who had brought his grandfather back to Hood County to live out his days. They met at the residence of a Sam Rash where they talked for the next 9 days until Dalton’s death. During that time, Dalton came to trust the sheriff, giving him his spurs, handcuff and favorite necktie. The sheriff was called to Estes Funeral Home following Dalton’s death where he performed an examination of the body. Sheriff Baker said that he counted 32 healed bullet wounds from Dalton’s forehead to his knees, a rope burn scar on his neck, healed wounds on both feet and a missing end to his index finger. 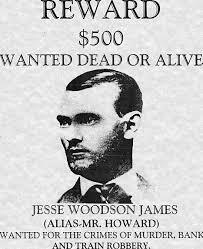 As a result of all this, Sheriff Baker concluded that the man he had interviewed was indeed Jesse Woodson James. There is now a large granite headstone in the name of Jesse Woodson James in Granbury, Texas at a cemetery near the intersection of North Crockett and Moore Streets. His date of birth is listed as September 5, 1847 and date of death listed as August 15, 1951 and also bears the words “supposedly killed in 1882.”. The gravesite belonged to a local named resident Sam Rash. A DNA test was to have been attempted in February, 2000 after a local businessman and Jesse James enthusiast financed the exhumation of Dalton’s remains. The test was not conducted after workers discovered that the grave site was incorrectly marked. A local judge had allowed the exhumation of a gravesite thought to be Dalton’s. When the workers reached the casket, it was metal rather than wood, as Dalton’s had been. The casket exhumed was found to be that of Henry Holland, a son in law of Sam Rash, who died in the 1920s and is also buried in the Rash plot. The judge’s exhumation order allowed for the removal of one casket, so the procedure was concluded. Granbury residents said that Dalton’s gravestones had been stolen several times over the years, leading to confusion of the location of Dalton’s and Holland’s graves. There’s a similar story that James died at the age of 96 and was buried in Blevins, Texas (Falls County) near Marlin under the name of James L. Courtney. Reportedly in 1871, Courtney confessed to former Texas Ranger Thomas Barron that he was the outlaw, Jesse James. Courtney married Barron’s daughter Mary Ellen shortly thereafter and lived out the rest of his life in Blevins, Texas. As far as we can determine, no DNA tests have been performed on Courtney’s remains. However, those familiar with their family genealogy say that Courtney and James could actually have been distantly related even if they were not the same individual. So, the two Texas links to Jesse James remain unproven and the mystery remains unsolved. For many years, the Dalton gravesite was part of a Sunday afternoon Granbury Cemetery Stroll with costumed re-enactors portraying the roles of Dalton and Holland, among other notable residents. At this writing, the cemetery is part of the Granbury Ghosts and Legends Tour conducted each Friday and Saturday night, year round. This one was really quite interesting. The man names Gates or Dalton must have been Jesse James due to all the wounds on this body. Yes James. I had not heard all of the facts before I started researching it. It is pretty strong, all right. Excellent information. There is a lot of contaveresay on this issue, and anyone could claim he was Billy the Kid, but the man Gates or Dalton has the most credibility. No one but a real outlaw would have this many healed wounds on his body. It would have been easy for him to fake his death and let someone claim the reward and the glory. Then he slipped away to lead a straight life. It would have been easy to do in this time period.